Jasper takes him through town and to his secret glade in the bush, and it’s here that Charlie bears witness to Jasper’s horrible discovery. With his secret like a brick in his belly, Charlie is pushed and pulled by a town closing in on itself in fear and suspicion as he locks horns with his tempestuous mother, falls nervously in love and battles to keep a lid on his zealous best friend, Jeffrey Lu. Craig Silvey grew up on an orchard in Dwellingup Western Australia. He now lives in Fremantle, where at the age of 19 he wrote his first novel, Rhubarb, published by Fremantle Press in 2004. In 2005, Rhubarb was chosen as the ‘One Book’ for the Perth International Writers’ Festival, and was included in the national Books Alive campaign. Silvey also received a Sydney Morning Herald Best Young Novelist Award. In 2007, Silvey released The World According To Warren, a picture book affectionately starring the guide-dog from Rhubarb. His second novel, Jasper Jones, was completed with the aid of an Australia Council New Work Grant. Outside of literature, Silvey is the singer/songwriter for the band The Nancy Sikes! Craig Silvey grew up on an orchard in Dwellingup Western Australia. He now lives in Fremantle, where at the age of 19, he wrote his first novel, Rhubarb, published by Fremantle Press in 2004. In 2005, Rhubarb was chosen as the 'One Book' for the Perth International Writers' Festival, and was included in the national Books Alive campaign. Silvey also received a Sydney Morning Herald Best Young Novelist Award. 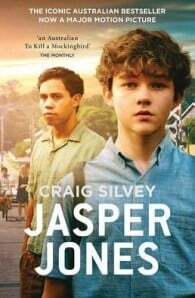 In early 2008, he completed his second novel, Jasper Jones.